I learned how to make date cake recipes in my early adult life. I have always loved these recipes or anything else made with dates. I have shared with you before about driving to Cincinnati as a kid with Mom and Dad and going to a bakery owned by close family friends (They could have been related). Anyway they made wonderful baked goods using dates. The date bars were my first taste of this fabulous fruit. I was overwhelmed and never forgot that taste. As a kid we never had dates in the house; I think they must have been too expensive. We usually had raisins so there had to be a reason Mom did not buy dates; we all loved those date bars. Now knowing a little about the history of dates and that they have been used for eating and cooking in the Middle East for thousands of years, it must have cost too much for preserving and shipping. The first recipe is my favorite. It has been on my list of Christmas cake recipes for many years and it is delicious. As you are learning how to make this date cake recipe you may hear some refer to it as the Brazil nut cake; I still cake it date cake. It doesn’t matter what the name is, the Brazil nuts and dates go very well together. Then add the great flavor of Maraschino cherries; how delicious! When adding to my holiday recipes, I always look for good fruit and nut recipes. I am always wanting to learn how to make date cake recipes and add new ones to my collection. These along with a variety of flavors and spices seem necessary for my holiday baking. (Maybe it is the aroma that I like.) Many people say they don’t like fruit cake recipes but there are so many completely different tastes and textures. 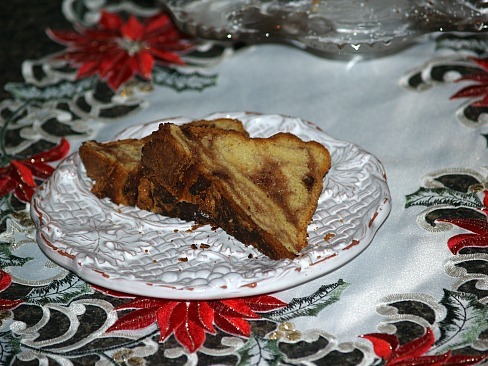 The Potica cake is another form of fruitcake or date cake recipe. It is totally different from what one here in the United States classify as “fruitcake”. It is very popular in Eastern Europe and is made with yeast dough. The date filling is rolled up in the dough jelly roll style producing a wonderfully flavored cake. I personally love most fruit cakes especially the date cake recipes. I usually make several at Christmas, cut them in small pieces and place them on my trays filled with a variety of cookies. They are firm and heavy and make a nice appearance on the trays. The various fruits and flavors help me to round off all the taste which I like to include in my holiday baking. Preheat oven to 300F degrees; grease and line with wax paper a loaf pan 9X5X3 inches. Combine nuts, dates and cherries in a large bowl. Combine and sift over the fruit mixture the sifted flour, sugar, baking powder and salt; stir to coat fruit. In another bowl beat eggs until foamy; add in vanilla. Stir egg mixture into the fruit and nut mixture until blended; spread into prepared pan. Bake 1 ½ to 2 hours; cool 10 minutes and remove from pan. Cool completely; sprinkle with whiskey and then wrap in whiskey soaked cheesecloth. Over cheesecloth wrap with aluminum foil and store in refrigerator for at least 2 weeks. The following date cake recipe is called a Potica cake. 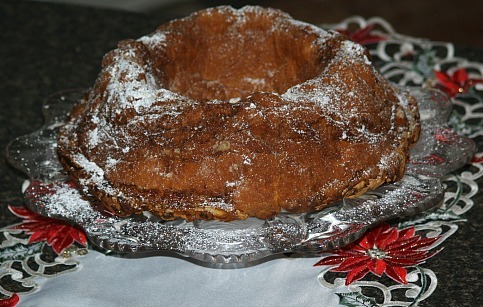 It is a traditional holiday cake for the Slovenian countries. 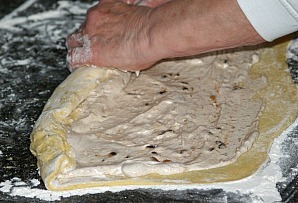 Unlike most of our cake recipes it is made with yeast dough. It is made in layers but during the baking it all becomes one cake. And very delicious! Heat butter and milk until butter melts. Stir the beaten egg yolks into the milk mixture; add to the flour mixture. Combine dates, nuts, cinnamon, 3 tablespoons sugar and milk over heat stirring to a paste; cool. Beat egg whites until stiff gradually beating in 1 cup sugar; fold in the cooled paste. 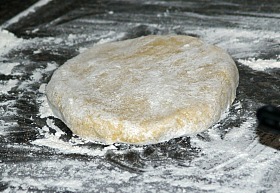 Roll out ½ of refrigerated dough into 20 inch square; spread ½ of filling over dough. Roll dough up like a jelly roll and place into greased tube or bundt cake pan. Repeat same with remaining ½ dough and filling; place over other roll in pan. Bake 65 minutes; sprinkle with sifted powdered sugar. Preheat oven to 350F degrees; grease, line with wax paper and flour an 8 inch square pan. Cover the dates with the boiling water; cool to lukewarm. Cream together shortening and sugar thoroughly; add egg and vanilla and beat well. Add the date mixture to the creamed mixture. Sift together flour, salt and baking soda; add to the date and creamed mixture. Stir in nuts; spoon batter into prepared pan. Remove cake from pan and cool completely; wrap tightly in plastic wrap. 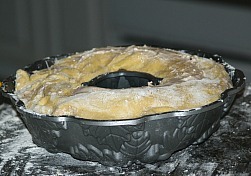 Preheat oven to 300F degrees; grease and flour large tube cake pan. Cream butter and sugar; beat in eggs, orange peel and buttermilk. Add the flour and baking soda mixing well. Fold in the dates, orange slice candy, coconut, pecans and cherries. Stir mixture until well blended; spoon into prepared pan. Bake for 1 hour and 45 minutes TO 2 hours; test with pick for doneness. TO MAKE CAKE combine dates, water, ¼ CUP sugar and salt in saucepan. Bring mixture to a boil; cook and stir over low heat until thick about 4 minutes. Remove date mixture from heat and cool to room temperature. PREHEAT OVEN TO 375F degrees; grease and flour 10X15 inch jelly roll pan. Beat eggs in a large mixing bowl on high speed for 5 minutes. Gradually beat in the ½ CUP sugar until thick and “lemony” color. 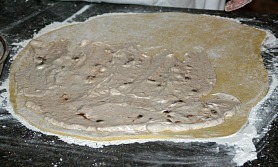 Sift together the flour, baking powder and allspice; fold into egg mixture. Spread batter into prepared pan leveling the top; sprinkle nuts over the top. Bake for 12 to 15 minutes; turn out onto towel dusted with powdered sugar. Starting at narrow end rollup cake and towel together; cool. Unroll and spread with filling; reroll (Without towel) and chill. TO MAKE FILLING beat together the cream cheese, butter and vanilla. Add the powdered sugar; beat until smooth and creamy. Chop dates into a small bowl; sprinkle with baking soda. Pour boiling water over mixture; let stand to cool. Beat butter with sugar with mixer until light and fluffy. Beat in the molasses and corn syrup; add eggs one at a time beating well. 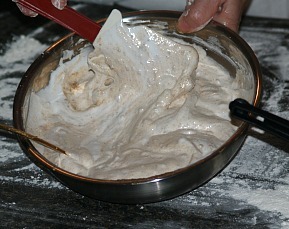 Sift together the flour and ginger; add to creamed mixture. Line bottom of 9 inch round microwave bowl with parchment paper. 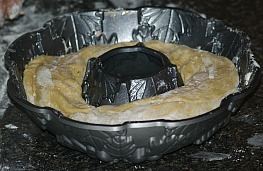 Pour batter into lined bowl; cook in microwave on high 8 ½ to 9 ½ minutes. Cool cake in dish for 5 minutes; turn out to cool. 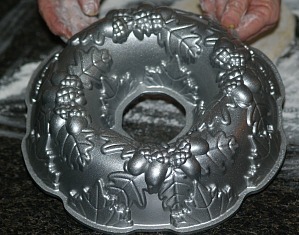 Sprinkle top with powdered sugar and serve; serves 8 to 12. Pour hot water over the dates and soda; cool. Cream butter and sugar together; add eggs blending thoroughly. Sift flour, cocoa powder and salt together. Add flour mixture and dates with liquid to creamed mixture. Add vanilla and blend mixture thoroughly; pour into prepared pan. Sprinkle top with chocolate chips and chopped nuts; bake 30 to 40 minutes. Cool in pan; sprinkle with sifted powdered sugar. Line bottom of angel food cake pan with brown paper. Grease paper and pan sides well; set aside. Sift flour, sugar, salt and baking powder into large mixing bowl. Add the dates, cherries and walnuts; mix well. In another bowl beat together the eggs, vanilla and reserved cherry juice. Pour egg mixture over the flour and fruit mixture; mix thoroughly. Spoon batter into prepared pan; bake 1 ¾ to 2 hours. Best if you wrap with plastic wrap and let stand at least 1 day before slicing.